This is my entry for the I Am Momma- Hear Me Roar Let's Hear It For The Boys shirt contest. 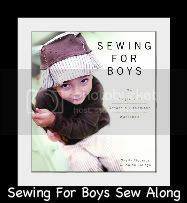 It is freezer paper stencil and applique. This contest is so much fun, I can't wait to see what everyone else made!! I think that is the best part. I wish this month would have been less busy so I could have made another shirt. I'll get that shirt made soon, I hope! My little bro was OBSESSED with Ghostbusters when he was a kid. I have seen that movie hundreds if not a thousand times and I like it too, it is a hilarious movie. Well my bro is having a baby boy in June. 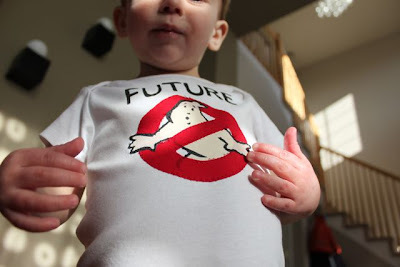 As soon as I found out he was having a boy I knew I had to make my nephew a Ghostbuster shirt. 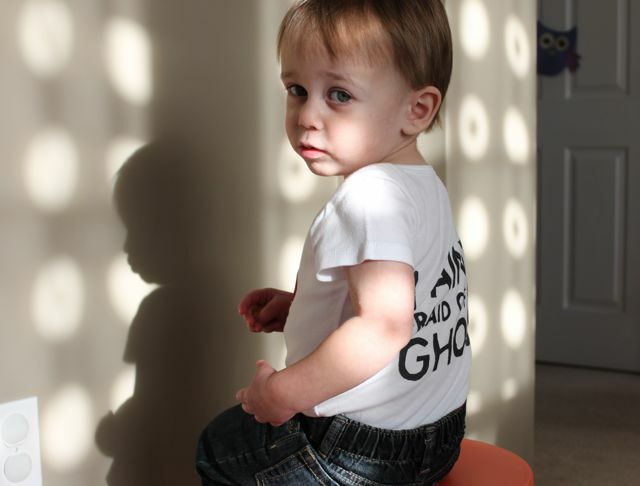 PB needed a shirt too, they will be busting ghosts together of course! I did freezer paper stencil for the words and the ghost. I found an image of the ghost through the google image search and used that as a guide. I painted the ghost on white fabric and cut it out and backed it with wonder under. The red strike out is red fabric backed with wonder under. The ghost and strike out were ironed onto the shirt and sewn in place. Sewing the ghost was very time consuming, I actually hand cranked my machine because there were so many small turns. Sewing the red strike out was much easier. PB says he is a "buster." 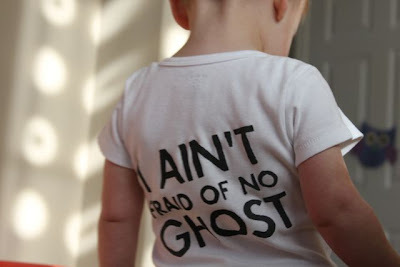 I ain't fraid of no ghost!! See the other entries here!! Oh my word that is too cute... especially the back!!! Love it!! The back is the perfect touch!! Too cute! Better not let my husband see it though. oh my gosh that last pic is ADORABLE! Great idea! Ha! Adorable! 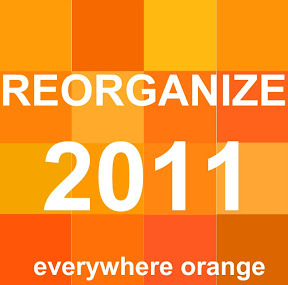 Great job and fun idea.